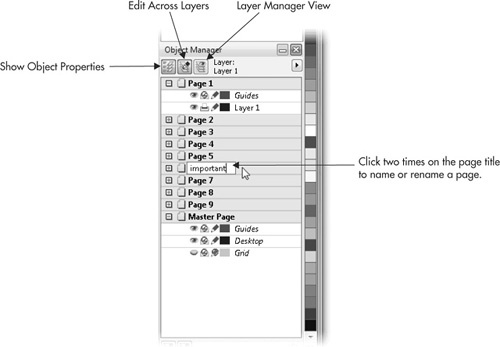 Whenever a new document is created, CorelDRAW automatically creates the names, such as “Page 1,” “Page 2,” and so on. These page names are only for your reference as you navigate your multi-page document. However, you can customize your page names by using several different methods. When creating web page documents—where each document page is a separate web page—adding a unique name to the page creates a title for the exported page. When your document is printed, page names can also be printed in the margins, can indicate the contents of the page, and can provide other page-specific information. To quickly display the previous or next page in your document, you can press PAGE UP (previous page) or PAGE DOWN (following page). Use the Rename Page command to assign a unique name to pages. 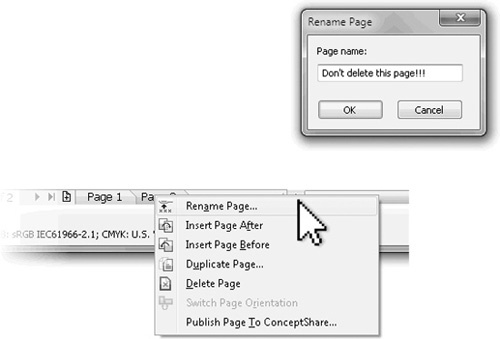 Either choose Layout | Rename Page, or (more quickly) right-click the page tab at the lower left of your document window, and then choose Rename Page from the pop-up menu to access the command. The Rename Page dialog, shown here, can rename a page with a name of up to 32 characters, including spaces. Document Properties is a CorelDRAW feature that provides details about a document you save without having to type in the margins. To access Document Properties—to both enter and view information—right-click on a blank part of the page. In addition to letting you type yourself little reminders, Document Properties is also a very convenient method to tag designs you export to JPEG and other bitmap file formats. As you can see in Figure 1, the same information you type in Document Properties is available to Windows users when they right-click your image in a file folder and choose Details. Figure 1. 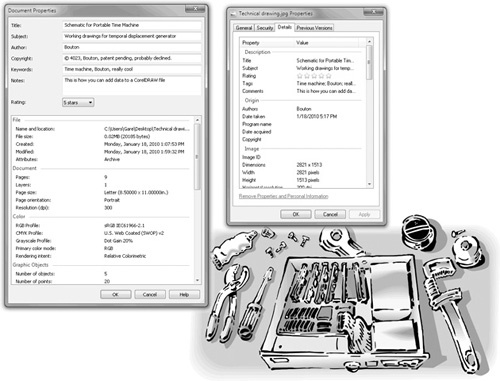 Save your CorelDRAW files and exported bitmaps with Document Properties metadata. Users who don’t own CorelDRAW cannot access Document Properties info you’ve embedded in a native CDR file by right-clicking. The solution to this problem is to make them buy CorelDRAW. To go to different pages in a document, click a page icon at the lower left of the document window. If the page isn’t in view, you can scroll to locate it, or (for lengthy documents) open the Go To Page dialog, shown next, by clicking between the Next Page and Previous Page buttons at the lower left of your document window. This dialog enables you to move quickly to a specific page in your document. To see more (or less) of the pages of your document in the page tab area of your document window, click-drag on the vertical divider between the page tabs and the horizontal scroll bar.